It may be April Fool’s Day today, but thankfully I was spared any embarrassment. It’s been a big week here in Ireland. 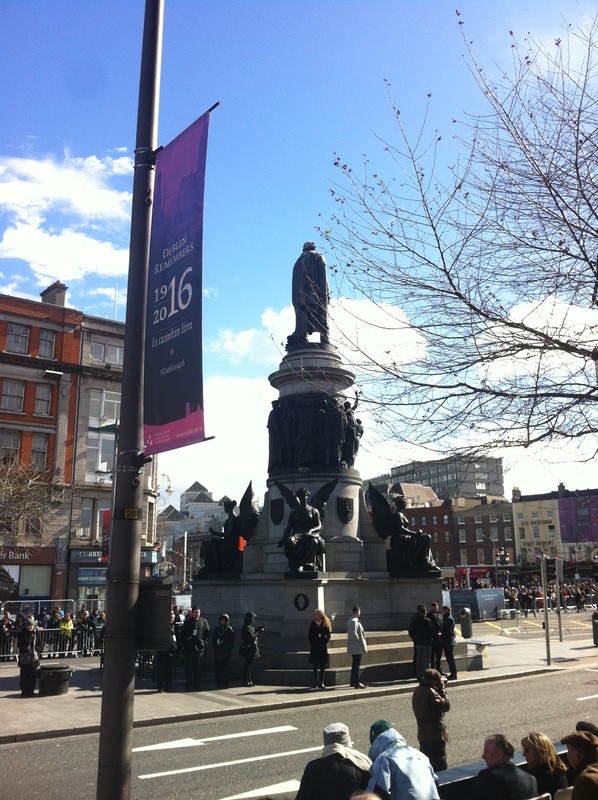 Hot on the heels of St. Patrick’s Day, we celebrated the centenary of the 1916 Easter Rising. The Easter Rising took place a hundred years ago, but started on Easter Monday, 24th April. A good site to check out is the official one, here. The rebellion lasted a week, and was focused primarily but not exclusively on Dublin. No need to rehash the details here, but it’s always been known in our family that we had a member, on the paternal side, in the GPO during the Rising. The official Roll of Honour of those present in the GPO during the Rising. My grand-dad, Henry Vincent, is numbered 146. The man in question is Henry Vincent Kenny, and is my grand-father. He died the year after I was born, so though we would have met, I have no recollection, naturally. His history, in full, has yet to be written, though of course, the official records are peppered with mention of his name and some of his deeds, including the main fact that he was not supposed to be there at all, as he was only about 20. It should have been his own father, but the commanding officer of his own battalion suggested that the likelihood of losing the main breadwinner of the family on those straitened times was great, and that the family should instead send the eldest son. Such is war, rebellion and sacrifice. His first task, after reporting to Liberty Hall, was to commandeer a car and take ammunition and supplies to the GPO, and for the next three days, he was a sniper at the windows. Along with a gent called Tom McGrath, he volunteered to go to Arnott’s department store on Henry Street to fetch red and white material to make a red cross flag to help get some of the wounded to Jervis Street Hospital. After the surrender, he, along with many of his colleagues, was sent to Knutsford Jail in England, and then on to Frongoch in Wales, until the Christmas of that year. He was a painter by trade, and was fond of a drink. I wish I knew more, and perhaps one day I will. That’s another day’s work. ‘Pa’s Medals’ as they are known in the family. The country put on a good show for the celebration (even if, as many pointed out, it really should have taken place about a month later). My Dad and I applied for and received tickets to a number of events put on for relatives of those involved in the original shindig. My Dad, Niall Patrick Kenny, with a lovely lady we met on the day, whose own grandfather was also in the GPO and Frongoch. O’Connell Street with the Spire. The great man himself, Daniel O’Connell. 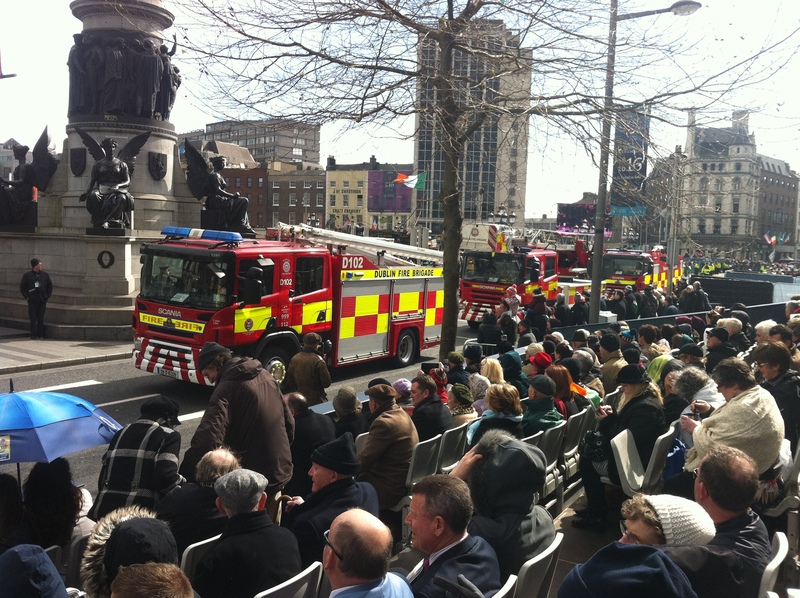 There was a large parade on Easter Sunday, and a number of other gigs around not just in Dublin but around the country. Overall, the events were a great success and struck a nice balance between commemoration and celebration. 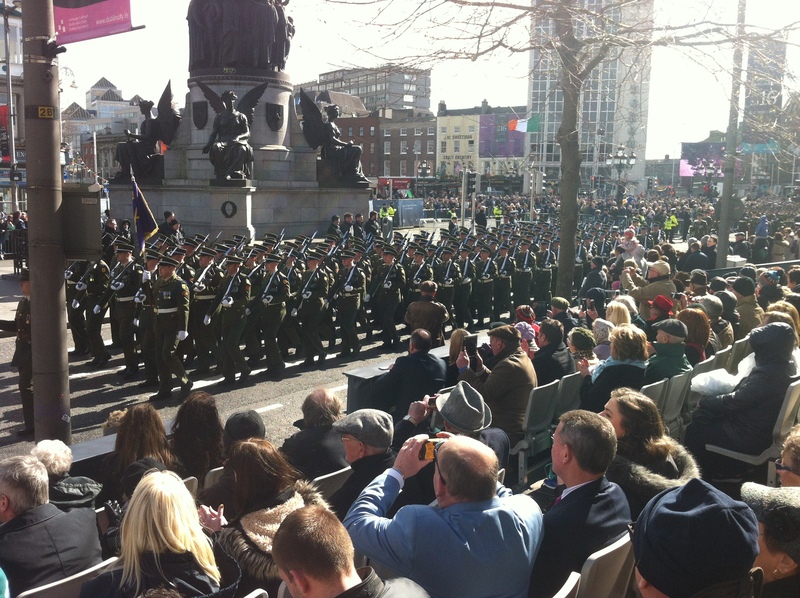 Admittedly, if you are not into military history, the main parade in Dublin may not have been your thing. 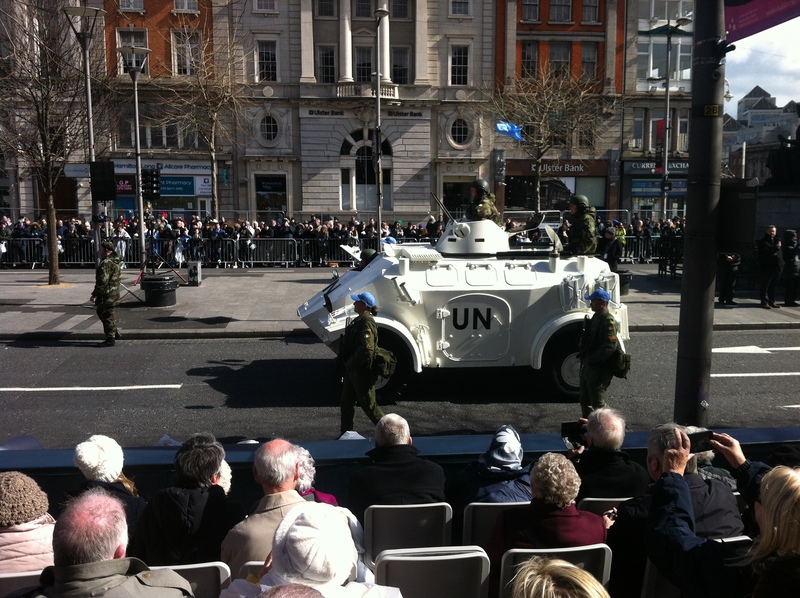 Just about every soldier, seaman and pilot marched (or flew) up O’Connell Street, with (probably) every piece of military hardware the nation owns. Afterwards, there was a lovely family reunion of sorts arranged by one of my Dad’s sisters, Auntie Emer. Many had made great efforts to be there, coming from Australia, America and England, to name a few places. Two of my brother’s sons also made it: one from the UK and the other from Dublin where he is currently studying. Adam and Saul Kenny at the Kenny Clan Gathering. As we made our way to the family get-together, the rain finally came down in a heavy shower, and then just as quickly blew over. 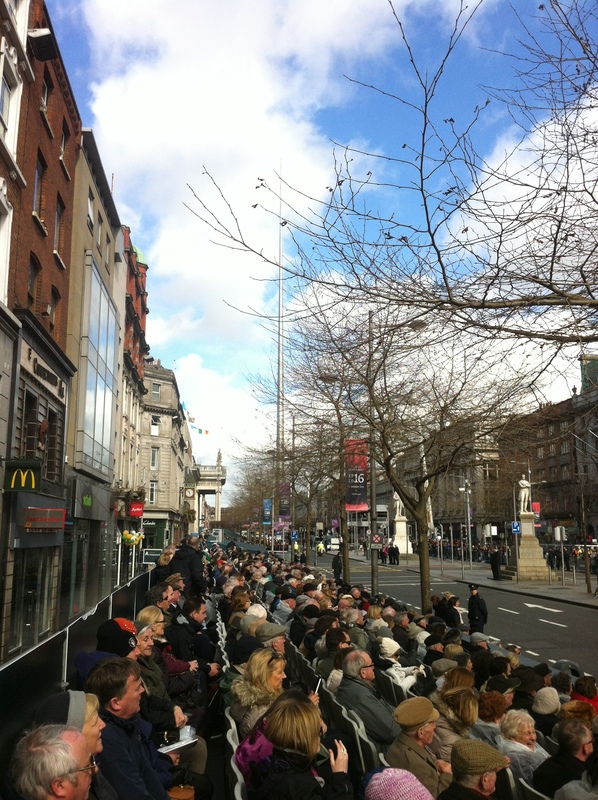 As we reached Dame Street, the sun came out, and caught the side of the Central Bank, towering over old Georgian Dublin. There is some metaphor there for the day that was in it, but readers can come to their own conclusions. I quite like this building. The architect, Sam Stephenson, is no longer with us, though he did live in Leixlip in the latter part of his life, so I did bump into him on occasion. Later that evening, we retired to the Salmon Leap pub and some pints were had, and we were entertained by the excellent Ross Breen and band. Okay, not the best picture ever, but that’s me, Saul, Adam, Dallan, Tamsyn and Saoirse. Was there much training? There was. Some. I didn’t think to note it all down in the diary, but there was some gym, a few runs, and one decent swim. On Monday, my good mate Mark hauled me out of bed (complete with groggy beer head), and we did about 7k in the Park. Tuesday was gym and Pilates; a good, tough session too. Wednesday was a rest day, and on Thursday, with the fine weather due to end, I enjoyed a nice trail run in the Park for about an hour. The pick of the week so far was the swim this morning. I got down to the pool nice and early and stayed for about 75 minutes, and managed 2.5kms. That’s the longest swim to date, for me. Not a marathon by any standards, but I was happy with it, not least as I felt good and finished well. I’ll leave you with a couple of pics from the trail. The rather creepy Toothwort, a speciality of St. Catherine’s Park woodland. For more info on this fascinating parasite, check out this site.